Wool Week | Blog | Celtic & Co. This October, The Campaign for Wool’s annual Wool Week will mark its 9th year with an extended programme of events, exhibitions and interactive consumer moments with an exciting line-up of activities and initiatives designed to educate, inspire and promote the benefits of wool. Running from the 8th – 21st October and with most of the events taking place in London, we decided to kick off our celebrations early this year when our founders Nick & Kath took part in The Prince of Wales' Campaign For Wool parade at the Royal Cornwall Show. It was an honour to be included and recognised in our home county for the work we do with our favourite all-natural fibre. Celtic & Co. are proud to support the Campaign for Wool. With the meteoric rise of fast fashion and micro-plastic wreaking havoc on our oceans and marine life, there's never been a better time to embrace natural fibres. One of the many benefits of wool is that, unlike cheaper man-made alternatives, no harmful fibres are released during the washing process. We create classic, timeless pieces which not only look and feel great but are better for the environment too. Learn more about the damage caused by synthetic textile fibres at https://www.whatsinmywash.org.uk/. The Campaign for Wool is a global endeavour initiated by its patron, His Royal Highness The Prince of Wales, in order to raise awareness amongst consumers about the unique, natural, renewable and biodegradable benefits offered by the fibre. Encouraging collaboration between an international community of woolgrowers, major fashion designers, retailers, manufacturers, artisans and interior designers, the Campaign has been instrumental in educating consumers about the versatility of wool, and reconnecting them with its myriad uses; From luxurious fine merino knitwear and cloth through beautiful hardwearing interior products to fire-retardant insulation for the home. 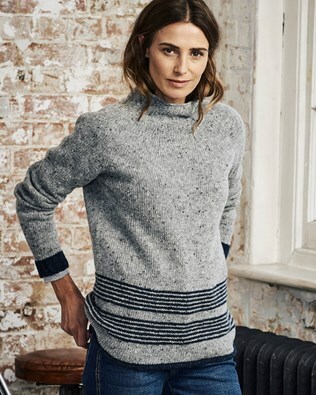 Since its launch in 2010, The Campaign for Wool has influenced a new demand for wool on an international scale, and its efforts have seen an outstanding threefold increase in the price farmers receive for their wool.